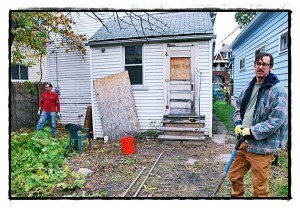 Business partners Steve Hughes (right) and Kevin Lynn (left) are remodeling this house on Norwalk, thanks to a federal grant. 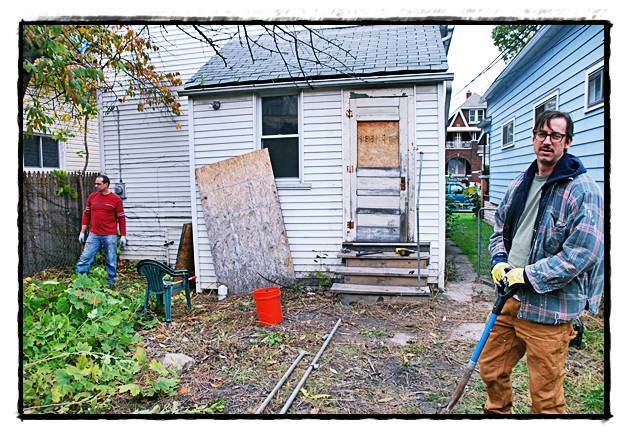 The federal grant that the city received to help tear down, renovate or build houses is already paying dividends to one group of builders who had a different idea. Business partners Steve Hughes, 44, and Kevin Lynn, 39, are builders who run their own company, Hughes & Lynn Building & Renovation. They were one of 40 contractors who put in bids, through the process of filling out the city’s very detailed application form, to receive some of these funds to, in their case, renovate and expand an existing home in the Norwalk and Brombach area. Their notion was to convert a 1913 farmhouse to a super-insulated and super energy-efficient home, employing a certain amount of recycled materials in the process while also enlarging the home from about 600 square feet to around 1,400 square feet. A few of the most obvious major improvements will involve a new front porch and a different roof line. While the house won’t be totally off the traditional energy grid, it will feature six solar panels. One bonus of having solar panels is that, if they generate more thermal energy than the home requires, the excess can be sold back to the power company. Another, and more unusual, way that Hughes and Lynn will be using recycled materials is that they will use the wood from a cherry tree that can no longer stay in the home’s backyard, which would otherwise have been disposed of, for some indoor flourishes and accents. The pair also plan to re-bag all the home’s newer cellulose insulation that was just blown into the attic a couple of years ago, and then reuse that, if not in this home again, then in the next one they work on. Their contract with the city calls for them to begin the work proper on Nov. 1 (and wrap it by the end of next March), but in fact they are already working inside the home to clean it out. Since it has been sitting empty for a while, it fell prey to some of the usual urban issues, as both homeless humans and stray animals appear to have combined to make a mess of the property over the past few years. Hughes, reached by phone on Wednesday, sounded tired — but also proud, and determined to make this home into something special. Well, sometime in the spring, start looking for a realtor’s sign on the lawn, and you might be the lucky one who’ll end up with a house with a couple hundred thousand dollars worth of craftsmanship for a fraction of that price. Or at least, you can get a look inside at what urban homes of the near future are starting to look like. Because it looks like, for this home, the future is now. Check out their website at hughesandlynn.com. I have been interested in solar energy for my home for a number of years and also in remodeling as green as possible. My home was built in 1913 also and needs some much needed updates. If at all possible, I would like some information about this solar energy method and any information you may have on remodeling “green” for older homes.